On Monday, I wrote about passing moments for TTM autograph collectors. Sometimes, death ends an opportunity. Or, those you admire might disappear completely. 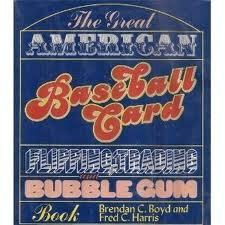 I wish I had written as a giggling teen who absorbed every page of The Great American Baseball Card, Flipping, Trading and Bubble Gum Book by Brendan C. Boyd and Fred C. Harris. I wish I had thanked the authors for their wacky attention to detail. I laughed. Then, I gave my own baseball cards a closer look. Who took the picture? Where was it? How did the player like the pose? Who wrote the card back? Who did the godawful airbrushing jobs? The questions never stopped. The questions led me to a greater appreciation (and amusement from) this hobby. Did the authors know they’d be remembered and revered three decades later? Note to publishers: where is the 30th anniversary edition of this classic? Coming Friday: Birthday present ideas for the collector. Do you mean 40th? The book, I believe, was published in 1973. BTW, Boyd also wrote an excellent novel about the 1919 World Series called “Blue Ruin”. Do you mean 40th? I believe the book was published in 1973. BTW, Boyd also wrote an excellent novel (“Blue Ruin”) about the 1919 World Series. Yikes! Now you know why SABR doesn’t think much of me, with my limited math skills…heehee. Correct. I should have said 40. America, don’t let me figure your batting average, or your taxes. Truly, it’s a good book (with as few numbers as possible for us mathphobes…). This is a great book and sits proudly on my bookshelf. Many of the 1950s photos were taken by Chicagoan George Brace. Whenever a new player came into town – or changed teams – Brace would take a photo. There’s an excellent book on Brace, “The Game That Was,” by Richard Cahan and Mark Jacob. It’s on my shelf too and probably my favorite one of all.